Simon Biddiscombe, server adapter maker QLogic's CEO and the driver of its Mount Rainier flash-enhanced HBA program, has resigned "to pursue other opportunities," with a search for a new CEO underway. Biddiscombe's departure comes after two years of falling revenue and a decline in profitability. He has also left his position as president and vacated his seat on QLogic's board. The board has appointed CFO Jean Hu as the interim CEO, which leads El Reg to believe there was no succession plan. Stifel Nicolaus analyst Aaron Rakers points out that Biddiscombe presented at an investor conference earlier his week. Perhaps the pitch was weak. Rakers adds: "We would note that this follows the fact that QLogic’s fundamentals have continued to deteriorate over the past several quarters with the company reporting an operating margin of only 15.1 per cent in its most recent (March 2013; F4Q13) quarter. 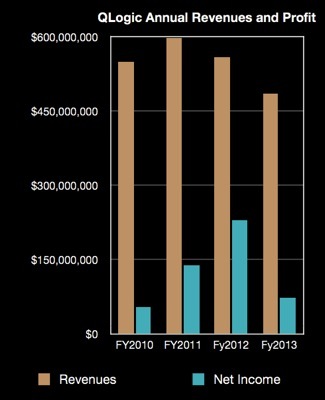 … QLogic’s trailing 12-month revenue reflects a 18 per cent yr/yr decline." Biddiscombe was originally QLogic's CFO, coming in from Mindspeed Technologies, before being promoted to CEO in November 2010. He sold off QLogic's InfiniBand business to Intel in February 2012. Then, in the face of a relatively static Fibre Channel HBA market - with virtualised servers no longer needing as many HBAs as physical servers and FCoE not taking off - he moved QLogic into server flash caching with the Mount Rainier project. The storage project adds flash caches to the Fibre Channel HBAs. But it's early days and it has yet to produce any meaningful revenue. The departing CEO was in Europe seeing customers in early May, just over two weeks ago, and there were no signs of his imminent departure then. A source inside QLogic told El Reg storage desk that the news came as a complete surprise. QLogic announced its fourth quarter and full fiscal 2013 year results on 3 May, showing both quarterly and annual revenues were down, although quarterly net income was up strongly. 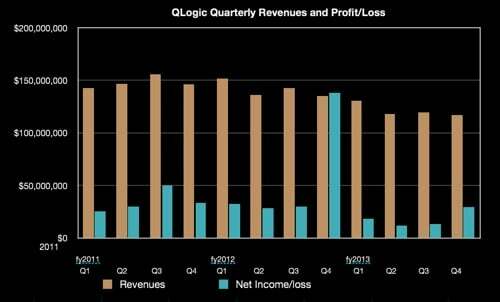 Compared to rival Emulex's loss-making activities, QLogic has been doing well. Perhaps revenues in the first fiscal 2014 quarter are looking poorly, although surely it's early to make such a judgment, as we're only about halfway through the quarter. In today’s world, IT organizations want everything to be better, faster, and cheaper. Updated Oh no, these patches kinda blow, go go Switchzilla!